13. Favorite quote "A Jedi acts not in anger." 17. Your favorite moment in The Phantom Menace: Darth Maul appears. 18. Your favorite moment in Attack if The Clones: Mace Windu appears. 19. Your favorite moment in Revenge of The Sith: The moment the helmet-mask closed. 20. Your favorite moment in A New Hope: Han shoots first. 21. Your favorite moment in Empire Strikes Back: Boba Fett's first frame. 22. Your favorite moment in Return of The Jedi: Vader redeemed. 23. Something you wished was different in the series: The 50s diner scene in AoTC. I wish it were cut. 25. 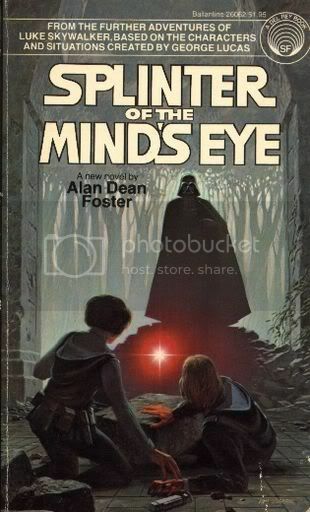 Your favorite book/ series from the Expanded Universe. 26. Your favorite Obi-Wan Kenobi quote "Who's the more foolish? The fool, or the fool who follows the fool?" 27. Your favorite Yoda quote “A Jedi acts not in anger." 28. Your favorite Darth Vader quote: "I find your lack of faith in the Force disturbing." 29. Best Star Wars related story/incident: I chose to marry my wife because she was the only woman I ever met who could correctly answer the question: "Who is Salacious Crumb?" 30. 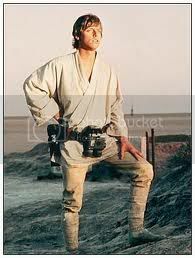 Why do you love Star Wars: Short answer: I grew up in the seventies and early eighties. Long answer: read Joseph Campbell. h/t No Smoking in the Skull Cave!